Cabestan and their star watch maker Eric Coudray have debuted a new timepiece for 2015 that is technically interesting and in line with the avant-garde luxury watch brand’s established theme. Cabestan is over a decade old but has lived through a rough time, having multiple owners (on owner number three right now, I believe) and having to survive the financial crisis. The coolness of the brand has allowed it to endure, and the brand’s newest timepiece creation is the Cabestan Triple Axis Tourbillon which I got to spend a bit of time with at Baselworld 2015. According to Cabestan, the Cabestan Triple Axis Tourbillon watch is the first model they have released which was 100% created by Eric Coudray. A devil to photograph, the wedge-style case uses some of the brand’s design codes, and a little bit of the Jaeger-LeCoultre Gyrotourbillon II watch that Coudray also developed. The latter of which I see in the orientation of the movement, the dial, and the style of the tourbillon itself. 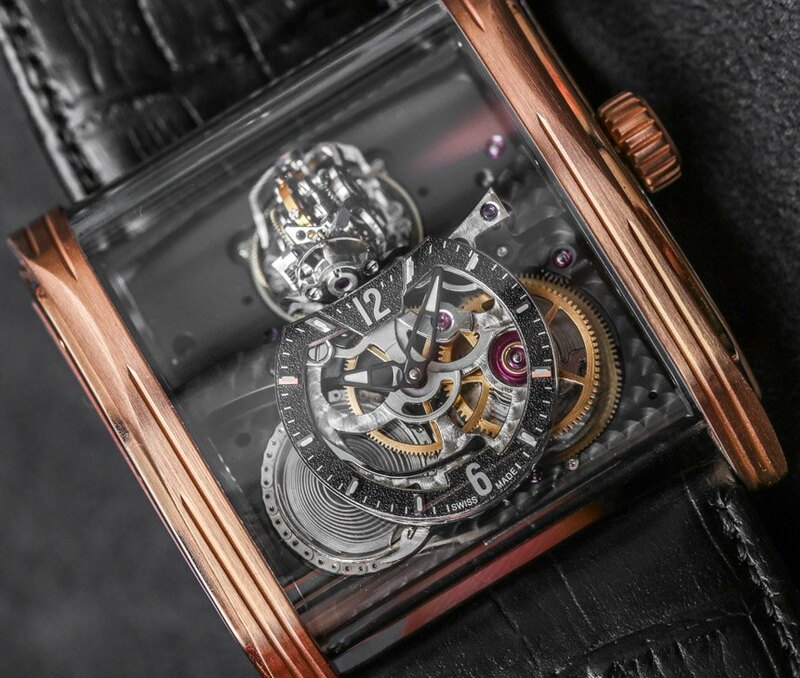 To best understand the Cabestan Triple Axis Tourbillon watch, it is a good idea to separate its key talking points. First is the fully visible movement that sits on display in the case, next is the three axis tourbillon, and, of course, the fusee and chain transmission system that is both complicated but also ensures constant torque delivered to the escapement. I want to speak about the fusee and chain transmission system, because it is a core part of the Cabestan brand which helped start it all with the Winch Tourbillon Vertical (that is what happens when you directly translate names from French to English). Like the brand’s flagship model, the Cabestan Triple Axis Tourbillon also features a fusee and chain transmission and a tourbillon – but it does so in a unique manner. The fusee and chain system is an extremely old concept which acts to move power from a slowly unwinding mainspring to the rest of the movement. The conical shaped gear helps ensure a consistent transfer of power, which makes this system one of the most traditional and basic (yet effective) forms of ensuring that as a mainspring winds down, the accuracy of the watch does not wildly fluctuate. That is all nice and good, but the real reason we love the fusee and chain transmission system today is because they look amazing. The small chain is produced entirely by hand – by Eric Coudray. It is made of steel and has 305 links and 202 rivets for a total length of 204mm. Just imagine how long something like that takes to assemble. This, again, is all part of the Cabestan caliber CAB EC 17 manually wound movement which is mostly produced from German Silver, and if I understand Cabestan correctly, also entirely by Eric Coudray. It is rare these days to find mechanical movements produced by a single watch maker, but it is one of the apexes of watch collecting. The movement in total has an amazing 1044 parts and a power reserve of 50 hours, operating at 3Hz (21,600 bph). 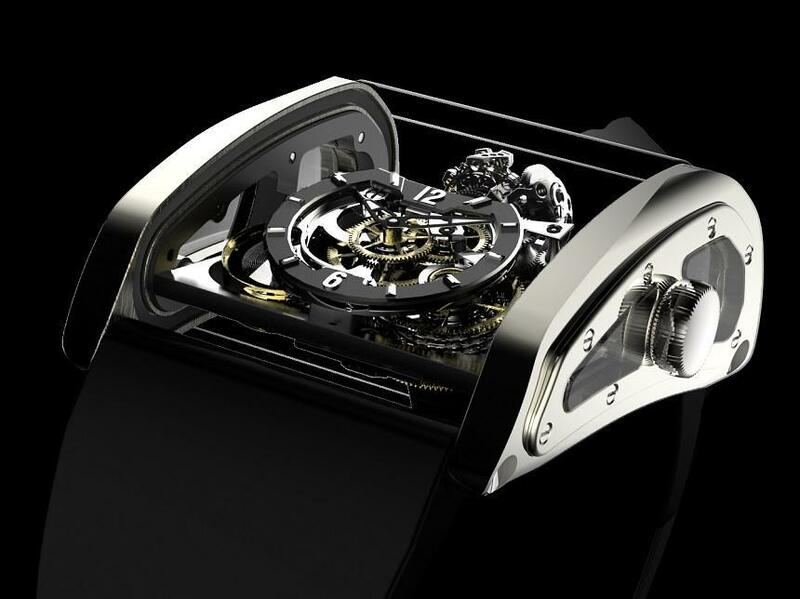 There is also the matter of the rather amazing looking triple axis tourbillon. 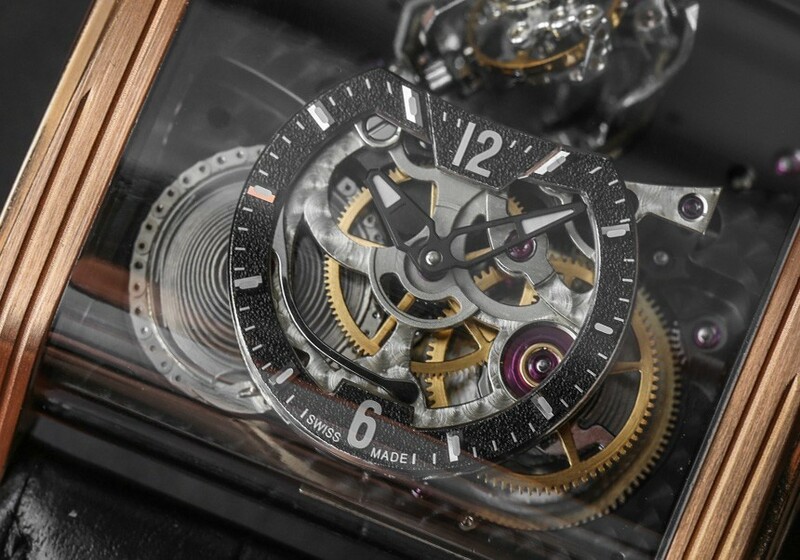 There are other three axis tourbillons out there, but none quite like this one that is presented so visibly and fully. 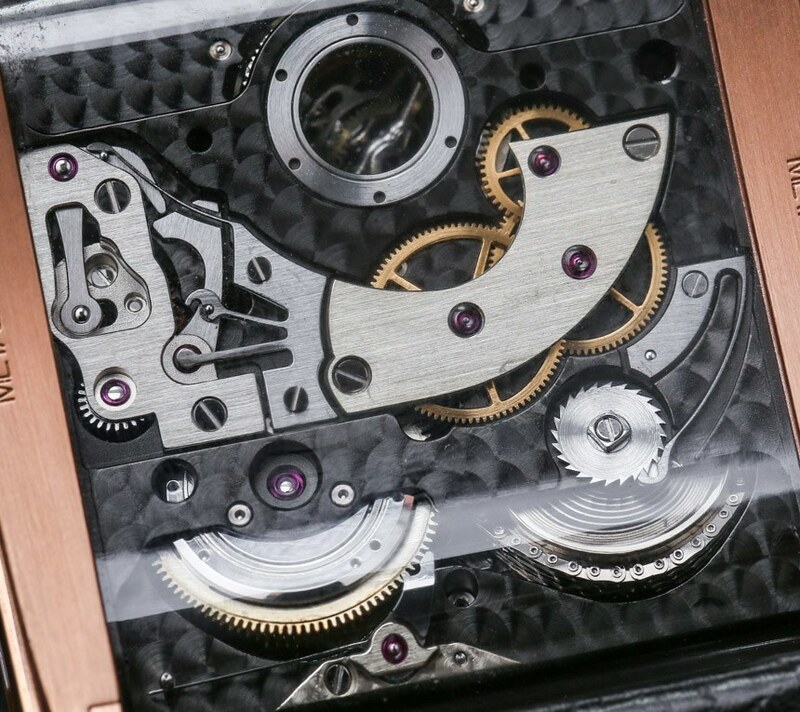 The entire system sits on a rotating base plate that turns, and then the tourbillon moves on two more axis points. 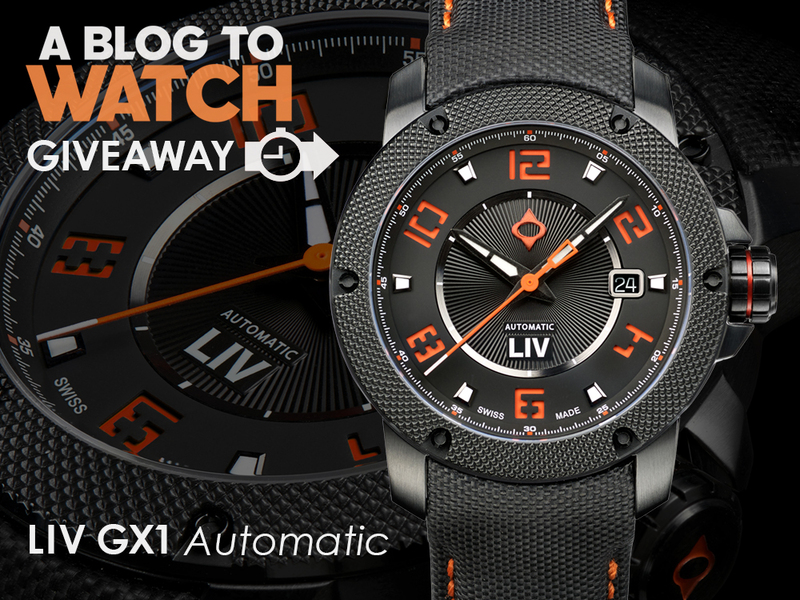 The rotation times are 60 seconds for axis one, 19 seconds for axis two, and 17 seconds for axis three. Those are some fast rotation times, so one of the major interesting elements of the Cabestan Triple Axis Tourbillon is just how much movement you can enjoy in watching it operate. 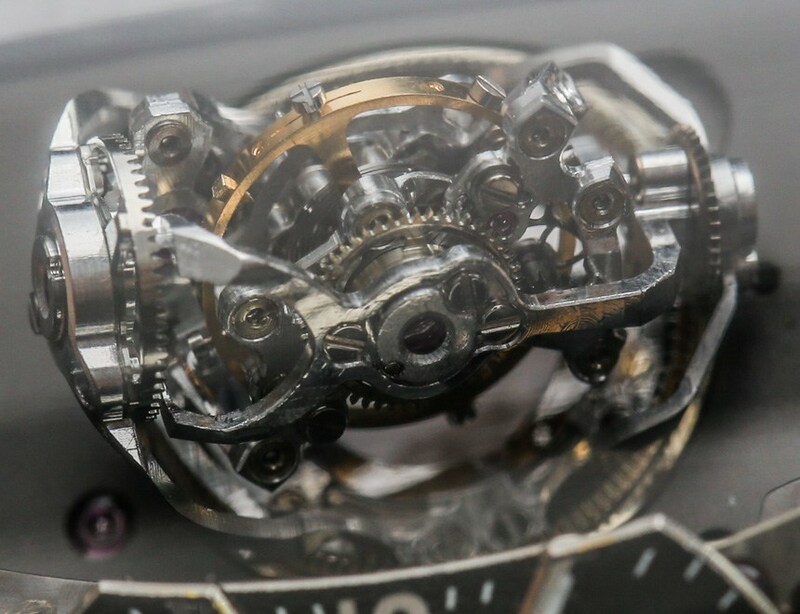 Technically very cool and visually remarkable, the prototype Cabestan Triple Axis Tourbillon watch that I saw had a pretty rough movement in terms of finishing. I am going to chalk that up to it being the “Basel watch,” and that most brands rush to get their pieces made in time for the show. Sometimes, these are just proofs of concept, and the final versions will be finished much better. I’ve seen a number of other “retail ready” Cabestan watches which have much better finishing, but in my photography, you can see how rough many of the surfaces are. 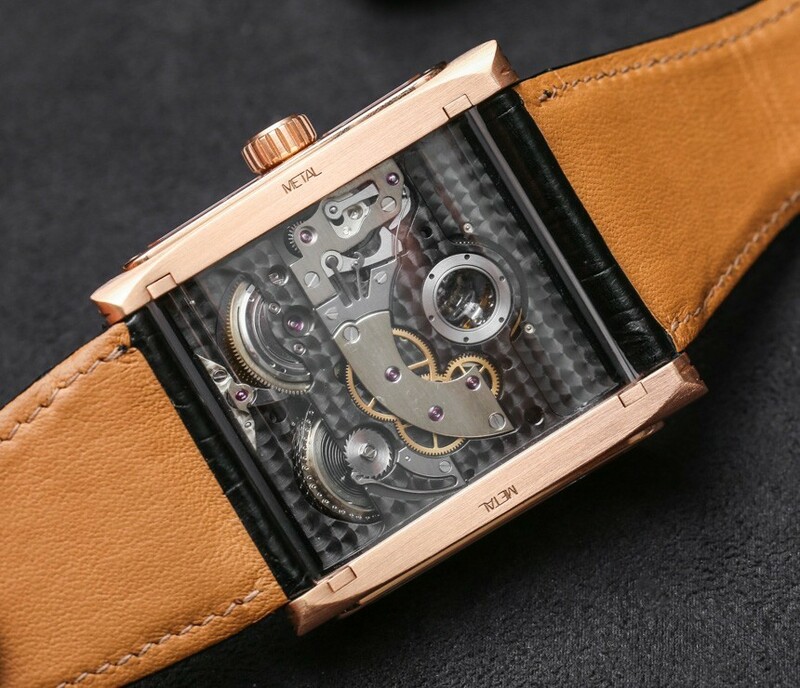 It is actually interesting to see that, because it helps people appreciate the time and effort required to decorate mechanical movements so that they offer the aesthetic appeal high-end watch collectors are going for. 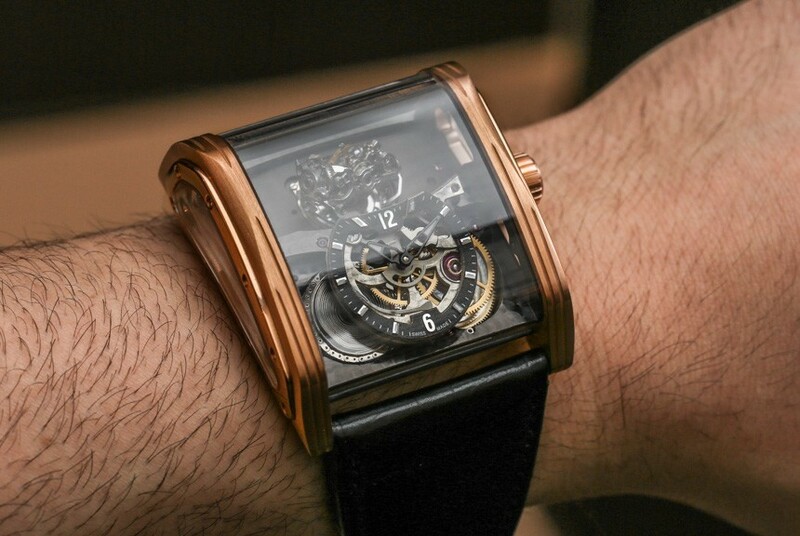 The Cabestan Triple Axis Tourbillon case is not exactly what I would call elegant looking on the wrist, but this isn’t meant to be an elegant watch. It is, however, much more easy to read than other Cabestan watches which use things like turning drums to indicate the time. The Cabestan Triple Axis Tourbillon uses a more traditional dial for the time. The case itself is 50.25mm wide and 45.50mm long (48.30mm with the crown). It is also a stately 22.30mm thick. 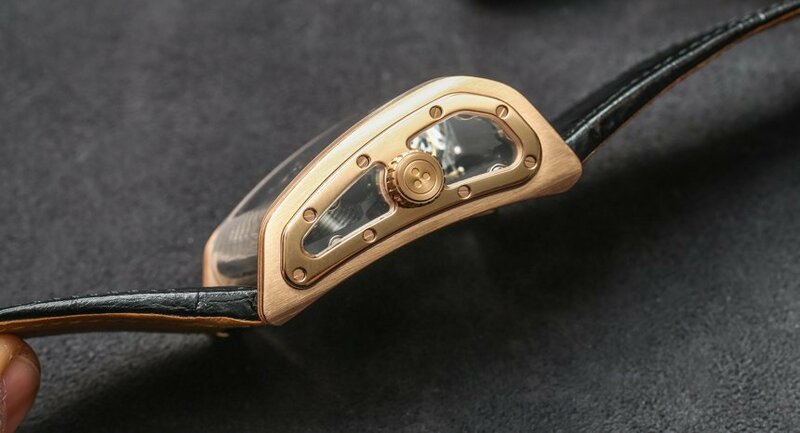 The case here is in 18k rose gold, but Cabestan will build them in titanium, PVD-coated black titanium, 18k yellow gold, 18k white gold, or platinum. The sapphire crystal is actually a single tube and, apparently, is both tooled and finished by hand. That means it sort of wraps around the entire case with two metal endpoints. It certainly makes for an interesting and unique case construction. With the watch, you get your choice of straps as well, made from things like alligator, calfskin, peccary, or rubber. Of course, you get a handmade box to go with it – this is common on such limited production timepieces so dependent on artisanal labor. Any triple axis tourbillon gets my attention, but nothing will ever be more impressive than Thomas Prescher’s first watch I saw live at Baselworld back in 2008. Quite beautiful in a weird way – and a technical colossus – a wonderful watcher’s watch — probably headed for a museum ………………..
Don’t really like it. The special feature of Cabestan watches is wide usage of those cool chains. On this model chain is almost invisible. 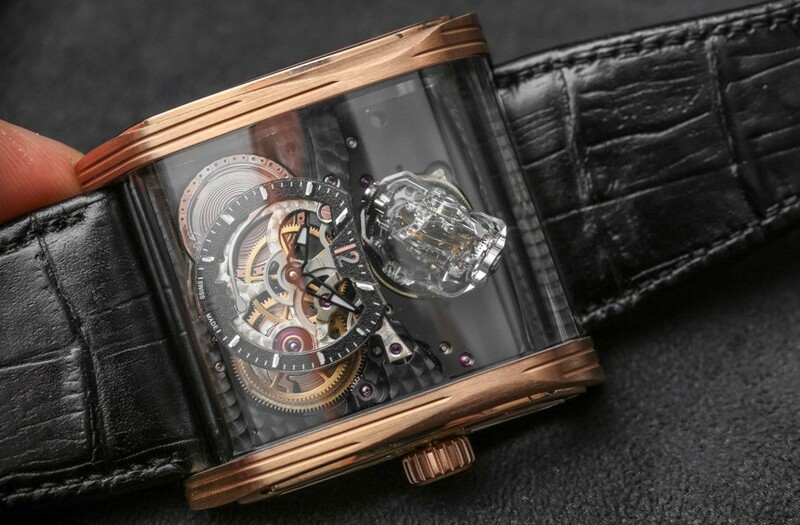 Instead the main accented part is tourbillon but it looks too small in square-shaped case. 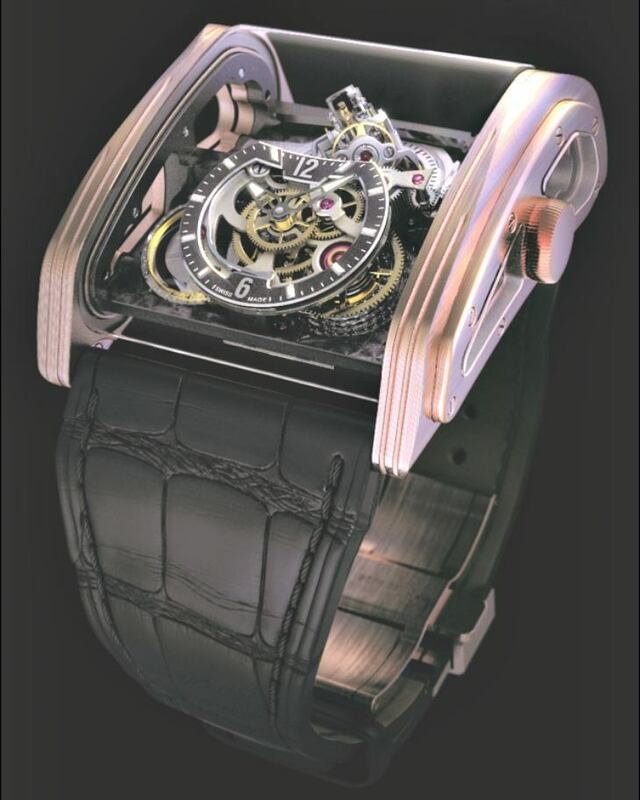 There is a lot of blank unoccupied space on both sides of tourbillon. Maybe in final version they will put something interesting there. Interesting to look at….but I would have loved a video of it working. As for the aesthetics of the watch itself….that needs a little work. But like someone else said…it’s probably headed to a museum somewhere. 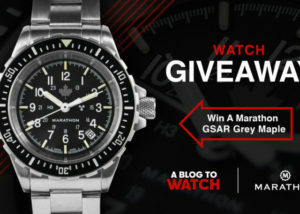 Thanks for the good article…..it’s nice to see watches like this. I love seeing out – of – the – ordinary.designs. .
Super cool. The wedge shaped profile helps out the square case design, which can look a bit dreary at times. That said, this is certainly tall and a bit awkward looking on the wrist. The fused chain looks awesome, but the mainspring looks cheap and poorly finished. Not that there is a lot of ‘finishing’ you can do to a mainspring, so I would have preferred it had a decorative cover over it. Yeah, it’s Metal as f*ck. I could sit and look at this ticking away all day. Holy “triple axis tourbillon”, Batman! Neat gears and drive mechs in this. But I wouldn’t wear it outside to cut the grass or trim the bushes. Reminds me of a German tool assembly from the 60s-70s. Lots of intricate things that mesh together to do something. gadgety I agree. If I were a watchmaker I’d probably have wept at the sight of Prescher’s Trilogy. I would rather have this exact watch doubled in size with no strap…it would be the perfect desk clock.